Bureaucrats in their offices are usually not considered the most photogenic of subjects (consider the possible hashtags: #boringpeople #dulloffice #paperwork #iwannadie). 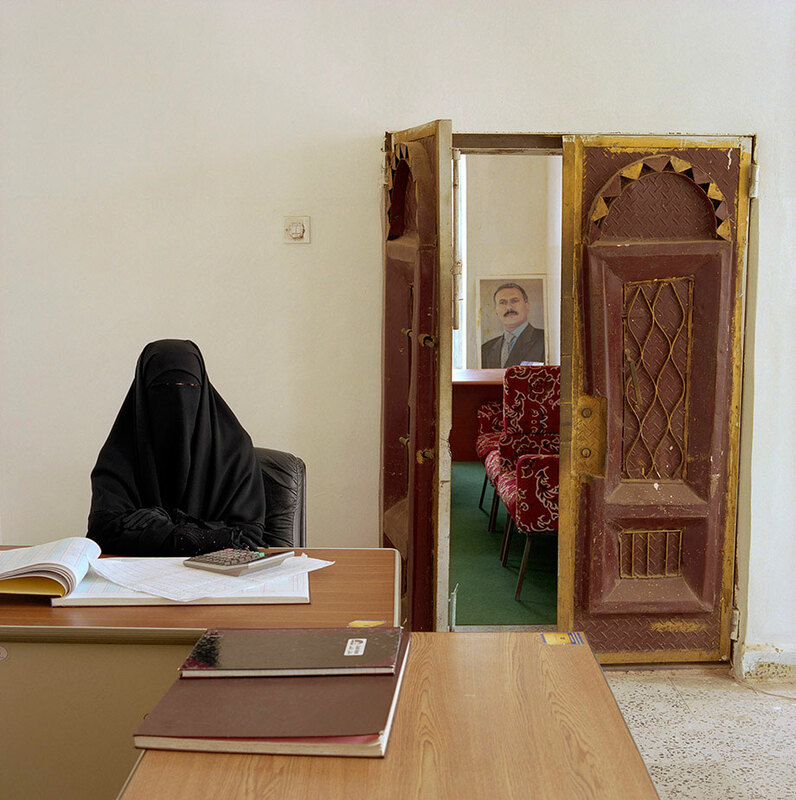 But Jan Banning’s series of portraits of bureaucrats in their natural habitats around the world manages to be both entertaining and sociologically perceptive. You might have seen the Bureaucratics project on social media (there are good posts at Slate, Petapixel and fstoppers) or exhibited in galleries and museums around the world. India-17/2003 Sushma Prasad (b. 1962) is an assistant clerk at the Cabinet Secretary of the State of Bihar (population 83 million) in The Old Secretariat in the state capital, Patna. She was hired “on compassionate grounds” because of the death of her husband, who until 1997 worked in the same department. Monthly salary: 5,000 rupees ($ 110, € 100). 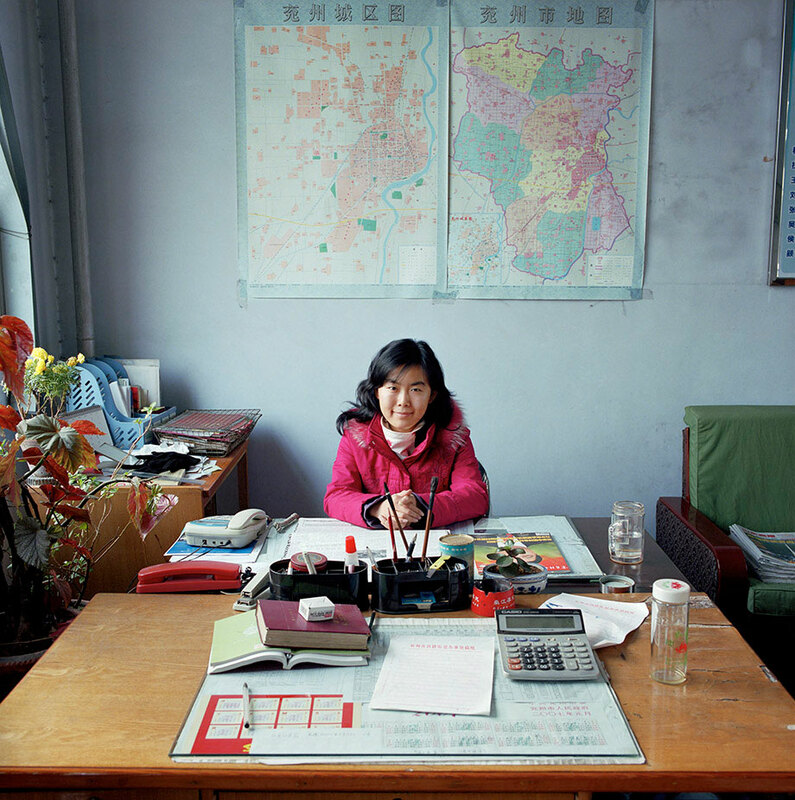 Jan Banning portrays 50 civil servants – mostly low-ranking street-level bureaucrats like policemen and social workers – from 8 countries: Bolivia, China, France, India, Liberia, Russia, the United States, and Yemen. The bureaucrats are pictured seated, directly facing the camera, almost merged with their office environment. In some cases, the office looks like it is going to engulf the person. In others, the bureaucrat is in control, everything has its place, the office is tamed. 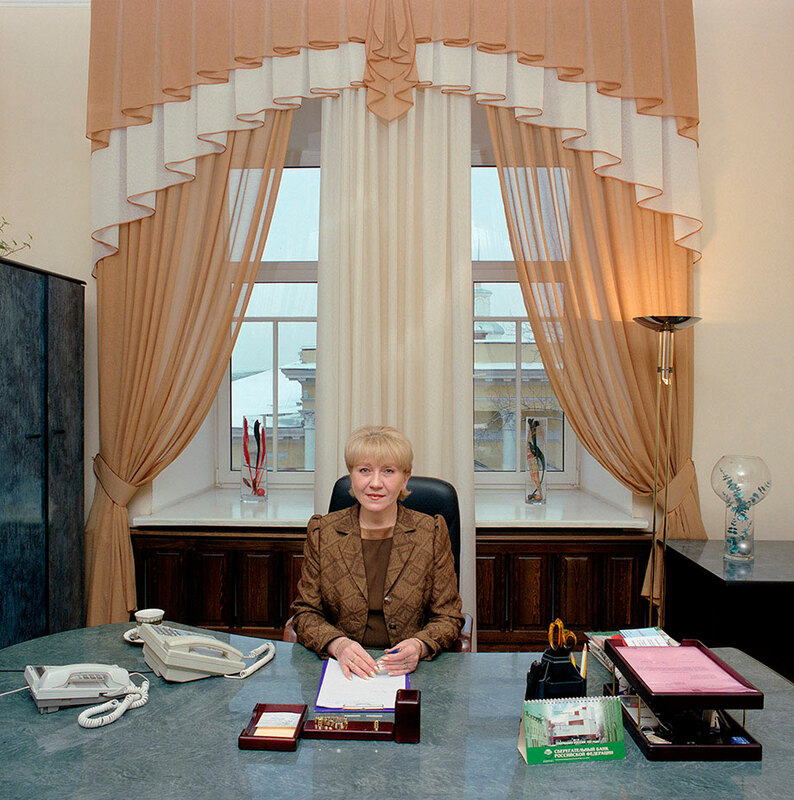 Russia.Lyudmila Vasilyevna Malkova (b. 1959) is a secretary to the mayor of the city of Tomsk, Tomsk province. She and her colleague take turns, working every other day, seven days a week, at least 12 hours a day. Monthly salary: 10,500 rubles. The square framing and deep focus work great to emphasize the interplay between the person and their work. And the bright, vivid colors give a sense of playfulness to this otherwise dull subject. USA, Texas. Rudy Flores (b. 1963) is one the 118 Texas Rangers state law enforcement officers, who cover 254 counties between them. 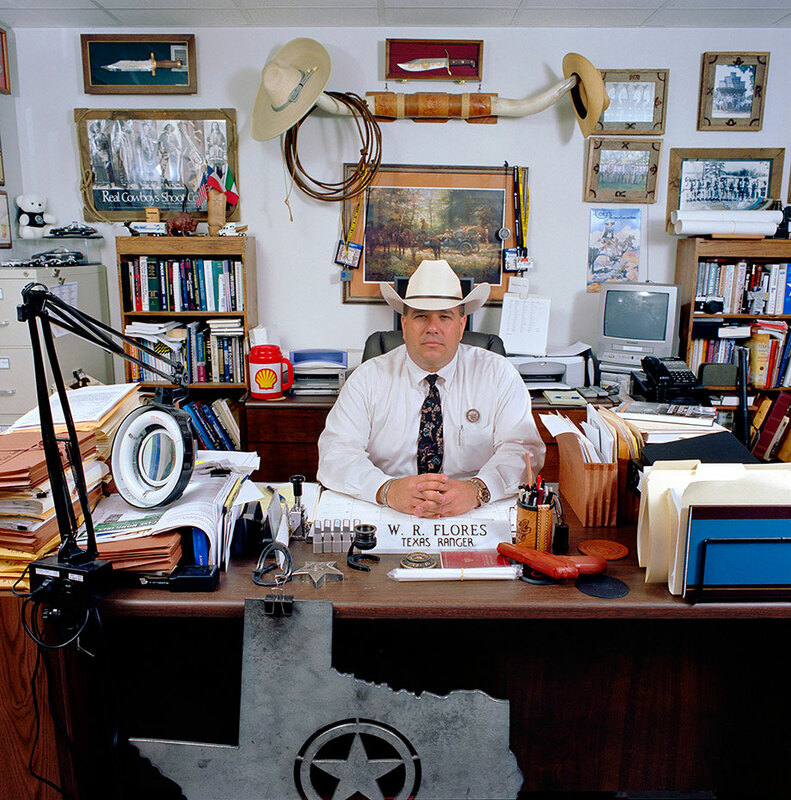 He is based in Palestine, Anderson County, Texas. He is responsible for three counties. Monthly salary: $ 5,000. You can see a wide range of emotions in the bureaucrats’ faces: boredom and pride, exhaustion and arrogance, dedication and contempt. To me, this is what makes the project fascinating: capturing bureaucrats as real people, as well as cogs in the bureaucratic machine. China. Wang Ning (b. 1983) works in the Economic Affairs office in Gu Lou community, Yanzhou city, Shandong province. She provides economic assistance to enterprises in her region and is the liaison officer between the government and local enterprises: she helps them get a permit for land use, personnel insurances, environmental permits and taxation registration.There was (at the time) no heating in the room. The maps show regional industrial zones. Wang Ning is not married. She lives at home with her parents. She works from 8.30 to 12 am and from 14 to 16 am. She has no official paid holidays, except the national bank holidays and the weekends. Monthly salary: 2,100 renminbi. The photos are annotated with information about the bureaucrat’s position, salary, and sometimes a snippet about the person’s life story. This makes Bureaucratics an insightful sociological study of comparative bureaucracy, in addition to being a beautiful work of art. 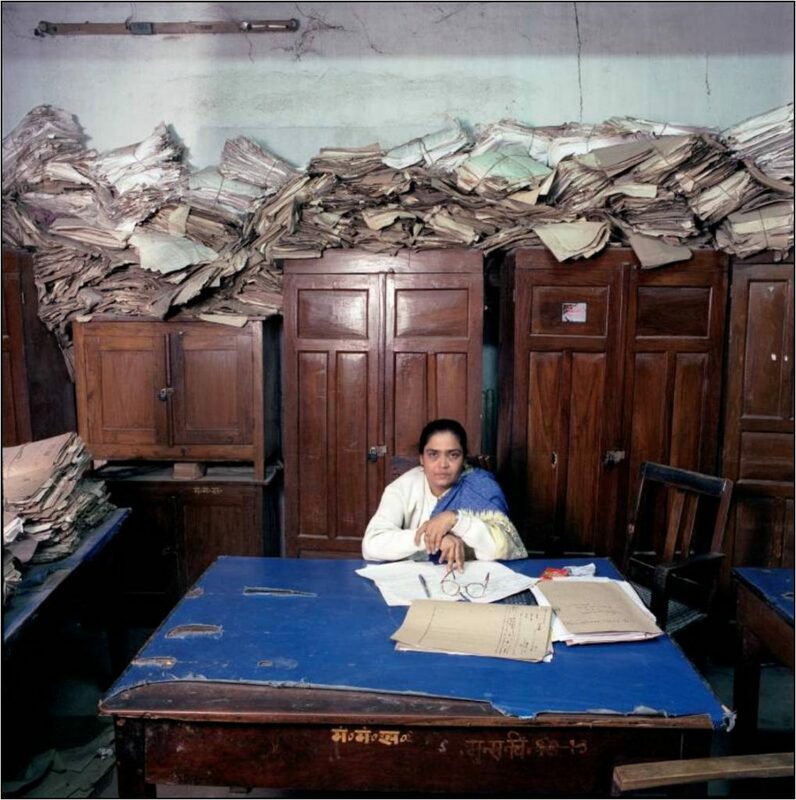 The series of photographs invites contemplation of the different working conditions, responsibilities, and social features of bureaucrats in these 8 very different countries spread around 5 continents. But it also hints at common patterns that give a shared meaning of what it means to be a servant of the state throughout the world. Yemen. Alham Abdulwaze Nuzeli (b. 1982) works at the regional office of the Ministry of Tithing and Alms in the city of Al-Mahwit, Al-Mahwit governorate. Monthly salary: 12,000 rial. You can see more of the photos at the photographer’s website or at the World Press Photo presentation. Order the Bureaucratics book here.